It’s Friday, time for the answer to Monday’s mystery fossil. Were you able to identify it? These fossils are from a fish called Enchodus, the “saber-fanged herring.” Teeth of Enchodus are commonly found in the Cretaceous-aged rocks in southwestern Arkansas, especially near Malvern and Arkadelphia in the Arkadelphia and Marlbrook Marl Formations, up into the Paleocene rocks of the Midway Group a bit farther north. In other places you can even find them in rocks of Eocene age, although you will have much better luck in the Cretaceous rocks. At this time, southern Arkansas was shallow to coastal marine. Go to the Bahamas, imagine Enchodus, mosasaurs, plesiosaurs, and plenty of sharks in the water around the islands and you would have a good picture of the landscape back then. They were abundant at the end of the Mesozoic Era and survived the asteroid impact that rang the death knell for many animals, including the non-avian dinosaurs. But they never regained their prominence as a key member of the marine ecosystem, eventually dying out completely in the Eocene sometime around 40 million years ago (the Eocene lasted from 55 to 34 million years ago). The fish reached sizes over 1.5 meters, which makes them on the large side, but not really big, considering there were mosasaurs in the same waters that surpassed 10 meters. Still, with fangs longer than 5 cm, they would not have been fun to tangle with. They were clearly effective predators on smaller fish and possibly soft animals like squid. 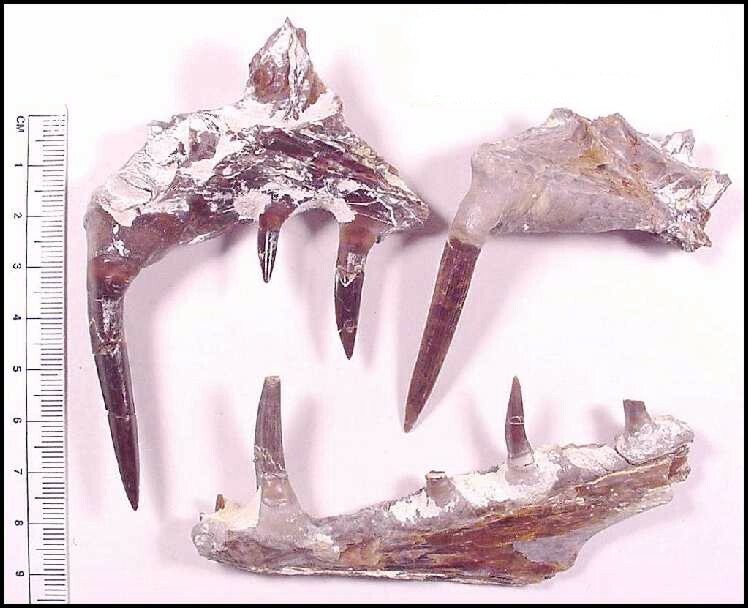 At the same time, fossils have been found showing they were themselves prey for larger predators, such as sharks, the above-mentioned mosasaurs, plesiosaurs, and even flightless seabirds such as Baptornis. Baptornis was a toothed, predatory bird, but as it only reached 1 meter or so, it would have only been able to hunt young Enchodus. So like many of us today, Baptornis was always up for a good fish fry. 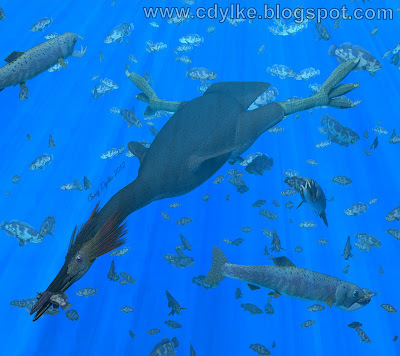 Hesperornis, a larger version of Baptornis, and a few Enchodus feeding on some herring-type fish. Picture by Craig Dylke. Enchodus is often called the “saber-fanged herring,” although it is unrelated to herrings. So what then was it? Herrings are what is known as forage fish, meaning they are mostly prey items of larger fish and other animals. Most of the fish called herrings are in the family Clupeidae in the groups Clupeiformes, which includes such well-known fish as sardines and anchovies. Enchodus, on the other hand, has been placed into the group Salmoniformes, which includes trout, char, and of course, salmon. When one typically thinks of trout and salmon, one doesn’t think of bait fish, they think of the fish that eat the bait fish. Thus, Enchodus would better better described as a fanged salmon (they were a bit large to call them fanged trout). By paleoaerie in Fossils of Arkansas, Mystery Monday, Paleontology, Uncategorized on May 16, 2014 .